Pilea mollis - back right corner. These are bushier and less tall right? Picture of tank (background is much further along than in this pic at this point). From top of substrate to top of tank, there's about 12" of growing room. Last edited by MKF; 04-15-2019 at 11:35 PM. I grow Pilea mollis/involucrata in crested gecko vivs. I've tried it in dart vivs, but it melts (too wet, I think). The other two plants you mentioned strike me as way too large for a 12 x 12 x 18. They would just fill the viv and squash out through the seams. 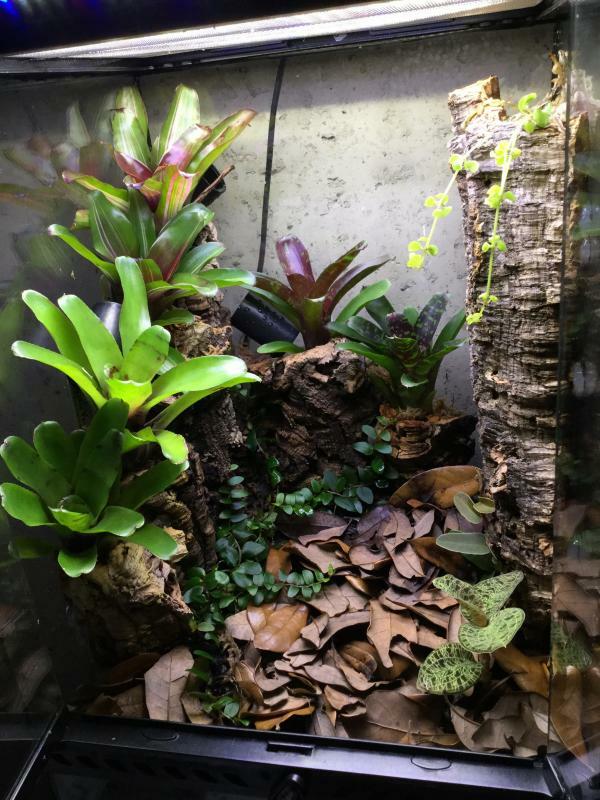 As an example, I think a big plant for a viv that size is a Neo that grows 5 or so inches across; a plant that big really is hard to deal with. It'll be imitators in this viv. I'd like to have something bushier in the ground cover rather than just putting broms everywhere. I just found something called a Syngonium 'Mini Pixie' that actually looks like a great option. I'll work it out, thanks for the input. Imis are great. 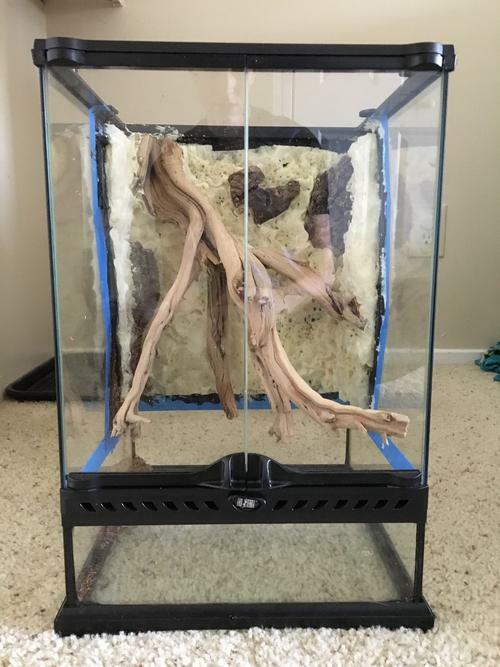 If they are to breed and raise their young in there, they'll like as many broms as can fit (I try to put 4 Neos in each 12 x 12 x 18, and they use them all) and lots of leaf litter on the bottom. Mini Pixie is a nice choice; mine stays really small (3 inches high, and doesn't spread much). What types of Neos do you use? I was looking at 'Wee Willy', 'Wild Tiger', and 'Chiquita Linda' as options. I keep all three of those -- they are nice, and small. 'Red Waif' is a lot like those three, too, and seems to pup really easily. I also like 'Fireball' and the variegated form of it -- 'Zoe'. I just got a few 'June Night' that really turn me on, too. So here are a few pics of some of the 12 x 12 x 18 vivs I have set up, just to help you visualize. Even with just smaller vines, this size viv gets really filled up quickly (yeah, they need some pruning... ). I keep a 1.1 pair of imis in each of the first two, and the last one (with the Neo 'stairs' up the left wall) is for a pair of vanzos once I get them sexed. The two lower 'stairs' in that viv are the 'June Night' that I mentioned. The tips of each leaf get a little red spike on the end -- really cool. Last edited by Socratic Monologue; 04-16-2019 at 12:49 AM. Ha, yeah those look pretty full! I'm sure the frogs love all the places to hide. Thanks for the visuals, that does help. On the first picture, do the broms at the top ever scorch their leaves being that close to the lights? Love the jewel orchid in the last tank! No, the Neos don't scorch, and varieties like 'Fireball' really need high light to color up well. Those are SD panels, currently running 100%, for reference. Yes, the Macodes petola is a really nice plant. Looks bright form a distance, and really intricate patterning close up. You could try a mini orchid like Trichosalpinx chamaelepanthes. They grow branching out into pendant chains of roundish leaves about 1/4" with magenta pink flowers around 1". Low light 500 to 1500 ft candles with temperatures from 52f to 80f. Encyclia and Socratic Monologue like this. I can add a heretical viewpoint on bromeliads for Ranitomeya. 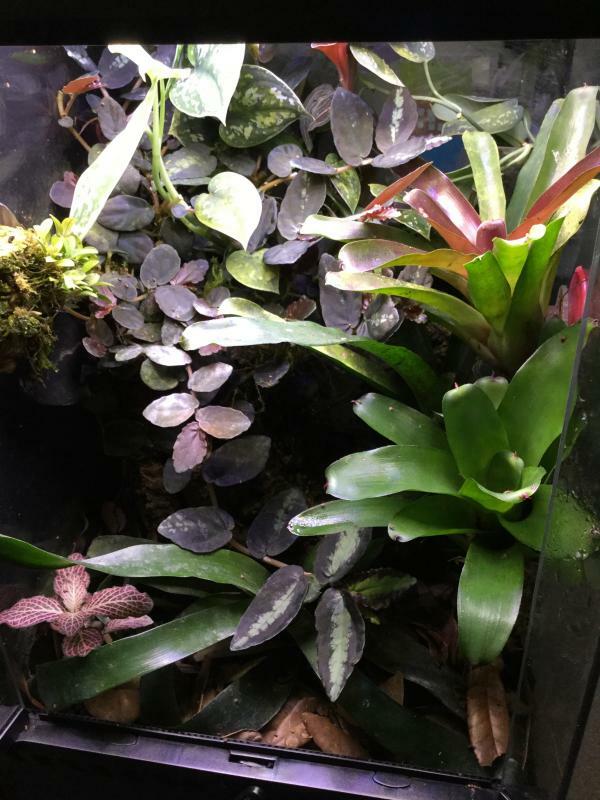 I will sometimes intentionally not have bromeliads in a Ranitomeya tank just so I can have some control over where eggs are laid. That way I can take the eggs out and let them hatch where I have a bit more control. This approach will deprive you of watching the male carry the tads to water and some other behaviors but can also maximize the number of offspring you raise. You can decide which of those things is most important to you and your feelings on the subject may change over time. On the other hand, I have no broms at all in my nominal fantastica parents' tank and they still lay eggs in some location I have never found. It's all good because they do carry the tads to water in the film canisters I have in there. However, they only typically will carry one tad per clutch, so I am essentially giving up half of the potential production. I don't mind that, though, since I don't need to be raising a million tadpoles :-) I assume that there is some positive selective pressure to give me the best tadpoles of the batch, but I have nothing to support this assumption. The tads that make it to the canisters almost always make it all the way to being healthy froglets. Beautiful tanks SM! I have really struggled to get good looking tanks that size. I have two 12x12x18s and they never look proportionate or right. Thanks for the suggestions! Thank you for the complement. I agree, it is hard to get these little vivs looking like something other than a plant in a box. I'm contemplating rounding up a handful of really little-leafed plants to try to get something together that looks like a miniature version of the big forest, if that makes sense. 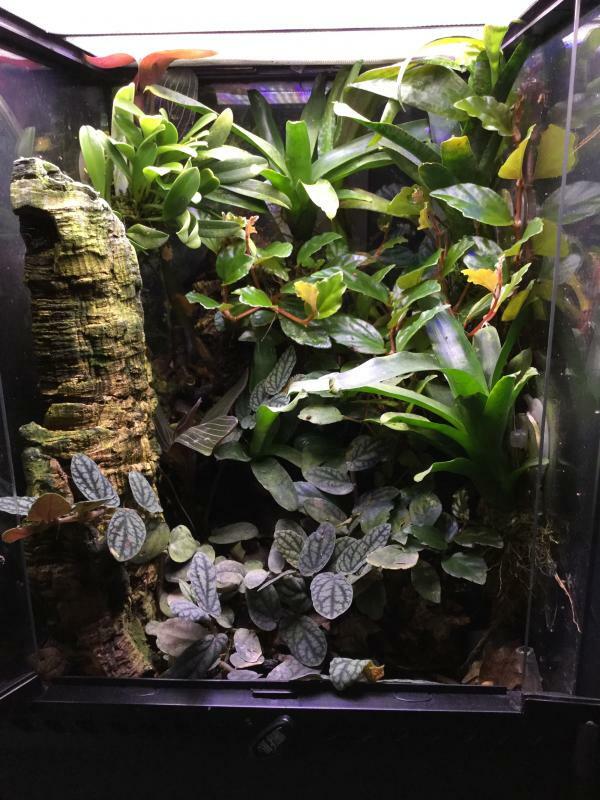 That small of a viv can be tricky but just try and use broms towards the upper part and maybe 2 or three smallish plants towards the bottom. I personally like silver ribbon ferns but it may not look right in such a small viv. I also enjoy different types of pellonia,pilea, and peperomia. One of my favorite pilea species is baby tears and after a while, it spreads and creates a nice carpet. Ficus pumila is very popular as it climbs the back of the viv and creates a shingle and dense green look on the background but if you don't trim it accordingly it will take over a 12x12x18. You may also want to look at ferns like a white rabbits foot fern. Personally, I stay away from begonias because while they can do really well I find they tend to melt away with the humidity. I'm staying away from ferns because they grow so fast and always get at least 12" wide. It'd take over my tank in no time. Anybody had any experience with Philodendron 'Pin Cushion'? Doesn't look like they get that tall (4-6"), just bushy over time, could be a good choice that's easier to prune. Last edited by MKF; 04-19-2019 at 02:42 PM.